This project encompasses research, design, and production of a map that documents the location of Hyannis Sea Captains’ homes, unique specimen trees, and relative historic highlights within this Nationally Registered Pleasant Street and School Street neighborhood in Hyannis. By bringing together the varied sources of information about this area of Hyannis into one document, the project will define a shared identity for the East End of Hyannis. 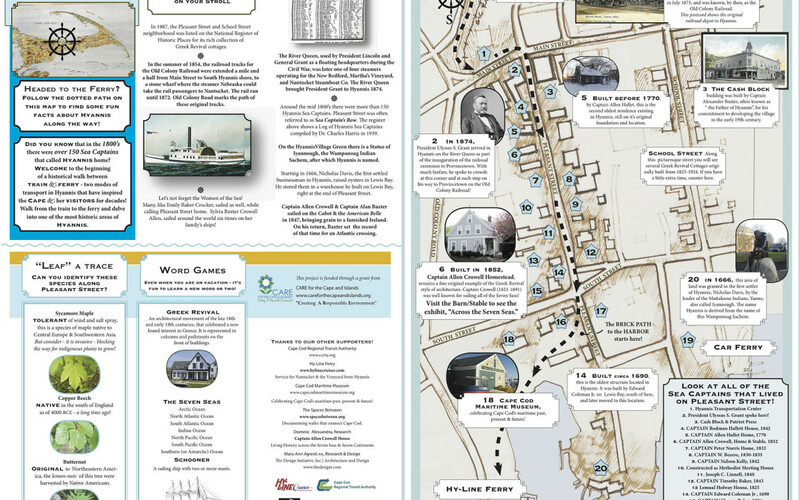 This descriptive trail map will encourage visitors who often walk through this neighborhood to access the ferry, bus and rail, to be engaged with this rich part of Hyannis history. The maps will be distributed, physically and virtually, through a variety of partners including the Cape Cod Maritime Museum, the Hyannis HyArts District and the Cape Cod Regional Transit Authority, among others.